young child, entertaining my family in Madrid with some sort of dance for them in their living room. "Baila un poco, Anita! ", they'd say & off I went! My grandfather was born in Andalusia, birthplace of Flamenco. It is said in our family that he was raised with the Gypsies of the caves in Almeria. When he was a young man, he moved to Morocco where he worked, met, and married my grandmother in 1919. A year later they traveled the Straits of Gibraltar and moved to Seville with my father who was born a month later and became a most talented and respected artist years later when he immigrated to Canada. During my annual travels to my homeland of Spain, I converted my research on Flamenco and the Moorish history of the country into two of my eight books: Vibrant Andalusia and Medina Mayrit. 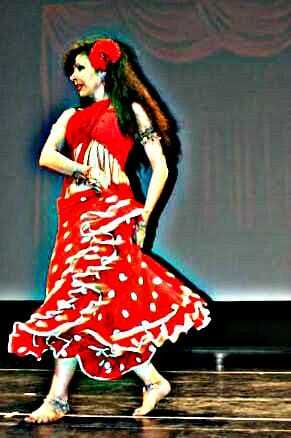 In 1998, I began taking classes in Flamenco, but about a year later, I discovered Belly Dance. Patricia Passo, & Evelyn Rio. Rehearsing Belly Dance Flamenco fusion just before the YMCA class. ​"Zambra Mora: An In Depth Study"